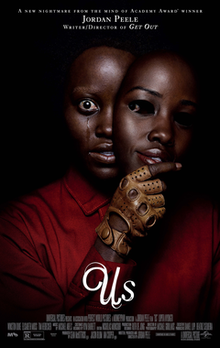 The 2019 movie Us surpasses the bar of a traditional horror flick, as the film dips its toe into numerous themes and genres that are usually unexpected from a “horror” film like this. The film serves as the sophomore feature of first-time director Jordan Peele, whose first flick Get Out was a box-office smash.While Get Out served more as a psychological thriller, Us can be view as a mystery thriller with sprinklings of comedy. With just watching the trailers for Us, audiences would simply see this as another scary where a group of people have to escape some supernatural danger in the form of dopplegangers– creepy! Yet after seeing this movie, I wouldn’t describe it as “scary” in the slightest. While how scary something can be is a subjective matter, the movie focuses on how real people would act in the abnormal situation that the characters are put in the movie. There are almost as many moments of humor that there are of fear because that’s just how some people will act in times of terror. The film exchanges the tiresome scary movie tropes of stupid character decisions with realistic characters who may have conflicting ways of handling a problem. What really drives the movie’s realistic characters forward is the performances by the actors. With seasoned actors, Lupita Nyong’o and Winston Duke– both of who dominated in The Black Panther— and newer actors, Shahadi Joseph and Evan Alex, as the main family, the chemistry between the four actually felt like a real family. Before jumping into all the thrilling and nail-biting scenes that got butts in the seats, the film takes the time to develop these characters and the relationships that they have with one another. So when all the craziness ensues, people have already grown to care for these characters and don’t want to see them die. The actors also had a challenge that is not very common in many movies today: play the protagonist and antagonist. Being as steep of a hill as that is, the actors are not only able to simply produce a contrast between themselves and their doppelgangers, but it’s done so well that many people could leave the theatre thinking that there different actors on the screen. Nyong’o herself essentially carries the movie as it is centered around her traumatic past and how it’s come back to haunt her in the present. The actress displays her immense depth and range between herself and her doppleganger. Bringing such distinction to both characters, Nyong’o is able to get the audience to understand–and at times even emphasize– the motives of herself, Adaelain, and those of the doppelganger, Red. Besides all the the acting and character works, the production and aesthetic of Us elevates it even higher than its competitors. The music of the film is as spine-chilling as the deformed doppelgangers. The music really puts the audience into the scene and gets them feeling even more frightened than they probably should be. The movie’s remake of the song “I Got 5 On It” by rap duo Luniz– which has had people creeped out since the trailer dropped– will leave audiences with an unnerving feeling after the movie. The movie also seems to lack any blandness in its look. The film plays around with different color compositions that it doesn’t look like some blueish, graying picture on the screen. Is the movie as gripping and awe-shocking as its predecessor Get Out? The short answer is no. The movie was a little too long and while the humor was great sometimes, other times it felt a little unnecessary and just shoved in for no real purpose. Besides those miniscule nitpicks, the movie is not only worth seeing but repeat viewings are recommended for better understanding of the events that occur in the film– especially after a deep diver into the internet to read fan theories on Reddit. I’d have to give Us a 4.5 out of 5, mainly due to that great twist at the end of the movie.